The East New York Community Plan was presented by Department of City Planning Chair Carl Weisbrod, Housing Preservation and Development Commissioner Vicki Been, Economic Development Corporation President Maria Torres-Springer, Small Business Services Commissioner Gregg Bishop, and Department of City Planning Executive Director Purnima Kapur. Together, the panel provided lengthy testimony on the details of the East New York Community Plan. The Plan would provide for the construction of 6,400 residential units by 2024—the last year of the Mayor’s Housing New York plan. Half of these units would be affordable to families earning up to 60 percent of the area median income, or AMI, which is the equivalent of $42,620 per year for a family of three. The Plan would prioritize the construction of 1,200 affordable housing units in the first two years on City-owned property, which allows for the provision of deeper levels of affordability than privately owned property. In addition to the construction of new affordable units, the area rezoned under the Plan would receive a cut of the City’s $1 billion Neighborhood Development Fund to invest into the infrastructure that supports the growing East New York population. The Plan would also provide for the opening of a new East New York Workforce1 Center, where neighborhood jobseekers would be able to receive job placement and training services. The Rezoning Plan would require the construction of more affordable housing than required under the Mayor’s proposed Mandatory Inclusionary Housing program, which is still under the Council’s consideration. However, the Plan still relies heavily on the passage of the MIH program. The Administration anticipates subsidizing 100 percent affordable housing developments over the next few years, but is relying on the MIH program to pick up where it leaves off by requiring future, unsubsidized housing developments be 25 percent permanently affordable. 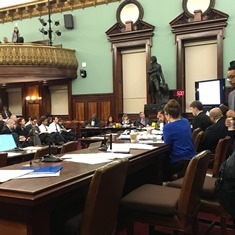 Subcommittee Chair Donovan Richards questioned the panel about the local hiring requirements set forth in the Plan, and noted that developers and contactors receiving $2 million or more in subsidies from the City should be required to post available jobs at the local East New York Workforce1 Center. According to Been, if approved, East New York would be the “first neighborhood scale implementation” of the Mandatory Inclusionary Housing program, which is currently still awaiting Council approval. She made a point to correct recent press coverage on a report issued by Comptroller Scott M. Stringer claiming that the Plan would cause the displacement of 50,000 East New York residents by testifying that instead, the accurate statistic is that, “50,000 people are already at risk of displacement.” Her testimony sought to drive home the point that unless affordable housing is built and regulated, East New York will quickly face gentrification and will see its long-time residents priced out of their homes. As the representative for East New York, Council Member Rafael Espinal’s approval or disapproval of the plan will form the crux of the compromise the Mayor’s Administration will likely have to make in order to garner the Council’s approval. Among Council Member Espinal’s major concerns is the Administration’s plan to ensure local jobs are created and job training is provided. He seeks provisions requiring a living wage, local hiring requirements, and job training programs for local residents. Opponents of the plan, including Council Member Inez Barron, who represents a small area of Brooklyn that would be affected by the plan, argue that the levels of affordability promised are not deep enough, as the median income for the affected neighborhood is below $35,000, which is well below 60 percent AMI. City Council: LU 0341-2016, 0342-2016, 0343-2016, 0344-2016 (March 7, 2016).